Card Text Play: Use an opponent's artifact as if it were yours. If my opponent doesn’t have any artifacts in play, can I still play Remote Access to gain the Æmber bonus? Yes. The first step in playing any card is to receive the Æmber bonus, if any. Therefore, you can always play action cards to get the Æmber bonus, but are still obligated to resolve as much of the action card as possible. If the “Play:” ability of the action card is not resolvable (e.g. there are no viable targets), you still keep the Æmber bonus. After using my opponent’s artifact via Remote Access, does it become ready again at the end of my turn? No. During the “Ready cards” step of your turn, you only ready cards you control. 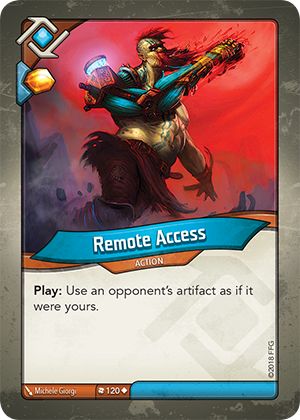 Therefore, an artifact used via Remote Access will stay exhausted for your opponent’s next turn and will ready itself – as normal – at the end of your opponent’s turn (during their own “Ready cards” step).